Guests 21 and over can join us in the Showbox Sodo lounge 2 hours prior to scheduled door time for food, drinks and priority entry into the showroom. 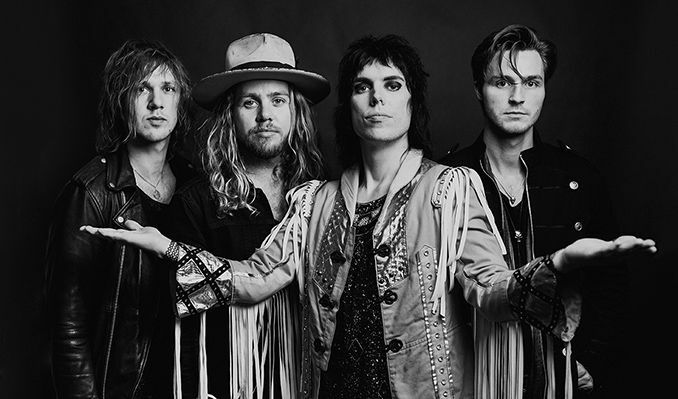 In just a few years, The Struts have found themselves massively embraced by some of the greatest icons in rock-and-roll history. Along with opening for The Rolling Stones, The Who, and Guns N’ Roses, the U.K.-bred four-piece was hand-picked by Mötley Crüe to serve as the supporting act for their last-ever performances, while Dave Grohl praised them as the best band to ever open for Foo Fighters. After making their full-length debut with 2016’s Everybody Wants, The Struts now return with YOUNG&DANGEROUS — a sophomore album that cements their status as one of the most unstoppably passionate and endlessly thrilling bands making rock music today. On YOUNG&DANGEROUS, The Struts let loose with the sing-along-ready and riff-heavy sound they’ve brought to stadiums and arenas all around the world. Working with producers like Butch Walker (Weezer, Panic! At the Disco) and Sam Hollander (Fitz and the Tantrums, Neon Trees), the band adorns that sound with deeper grooves and more inventive textures, dreaming up a majestic glam-rock revamp that’s unabashedly fun but full of pure heart.